Table Number Stands are chrome plated steel stands with 2 3/4" diameter weighted bases. Minimum order: 12 per size. Table Numbers are 4 in. x 4 in. white plastic cards with 2 3/4 in. high, black numbers printed on both sides. 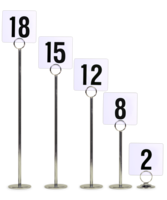 Stands shown above hold number cards indicating their size. 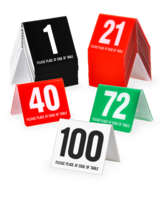 Numbers and table stands sold separately. 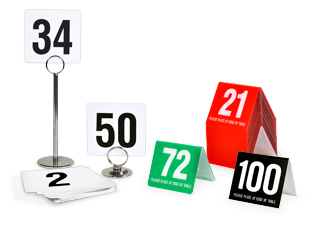 Table numbers and table number stands are chrome plated steel stands with weighted bases. Minimum order: 12 per size. Shop online with the Menu Shoppe today.